The Earth Systems Investigations (ESIs) are suggested learning paths that integrate resources from the CLEAN Collection and other trusted science and data content sites into a three-dimensional learning sequence (science and engineering practices, cross-cutting concepts, and disciplinary core ideas) that is engaging and meaningful to students. The three dimensions work together to help students build, over time, a cohesive understanding of science while developing the skills necessary to do science. As an educator, this three-dimensional learning sequence can give you the flexibility to design classroom learning experiences of your own that stimulate students' interest in science and help them to become science-literate and informed citizens. It is important to develop students' knowledge of how science and engineering achieve their ends while also strengthening their competency with related practices. We use the term "practices," instead of a term such as "skills," to stress that engaging in scientific inquiry requires coordination both of knowledge and skill simultaneously. ESIs are designed in a four-step process that incorporates most of the eight important practices listed below. Engaging in the practices of science helps students understand how scientific knowledge develops; such direct involvement gives them an appreciation of the wide range of approaches that are used to investigate, model, and explain the world. Engaging in the practices of engineering likewise helps students understand the work of engineers as well as the links between engineering and science. Participation in these practices also helps students form an understanding of the crosscutting concepts and disciplinary ideas of science and engineering; moreover, it makes students' knowledge more meaningful and embeds it more deeply into their worldview. 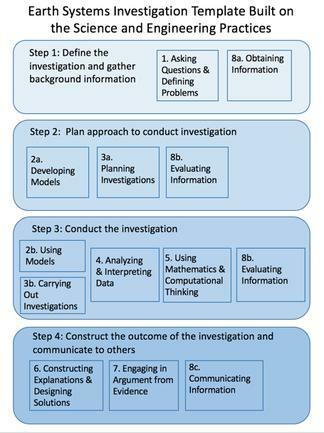 The resources in an Earth Systems Investigation are linked together to form a coherent learning sequence using a four-step process. In each step of the process, a number of CLEAN resources have been selected that address both the content of the primary topic and a set of specific science and engineering practices. The four steps are outlined below. The graphic at right that shows the sequence of science and engineering practices incorporated into each learning step. In this step of the investigation, students identify and discuss the issue or problem and begin to gather background information. In this step of the unit, students develop their approach and investigate models to begin answering the question(s) developed in the first step of the investigation. In this step, students conduct their own investigation and prepare to communicate ideas. In the final step of the investigation, students do a final project and communicate their results using interactive models and other resources. To build an Earth System Investigation, a "backwards design" process can be used. For a more complete introduction to Backwards Design process, view a PowerPoint presentation linked here. First, you establish the learning goals, or an essential question, for the investigation. What topic are you interested in developing an investigation for? What should students know, understand and be able to do? In the second phase of backward design, you think about how you will decide if students are starting to master the knowledge and skills you want them to gain. What will you accept as evidence that students are making progress toward an enduring understanding of the learning goal(s) of the investigation? In the two example ESIs, a performance assessment forms the central piece of Step 4. The performance assessment is intended to measure student understanding of central concepts and also incorporates scientific practices and crosscutting concepts. Resources can be used to form either the central part of the assessment or as adjuncts to the assessment you design for the investigation. Finally, after you have decided what results you want and how you will know you've achieved them, then you start planning how you're going to teach and what resources you will select to assemble a coherent learning sequence. What are the best resources, videos, labs, and visualizations that develop your students' ability to use scientific practices to master the learning goals of the investigation? How can they apply their learning to complete a performance assessment that will yield evidence of their understanding of the primary topic? The resources used for Earth Systems Investigations can be found in three major collections. 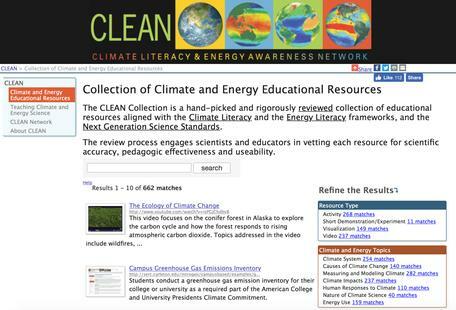 The CLEAN collection – The CLEAN collection is a handpicked and rigorously reviewed collection of over 700 educational resources that have been vetted by teams of educators and scientists. They are aligned with the Climate Literacy and Energy Literacy frameworks, and the Next Generation Science Standards. NOAA resources – NOAA resources are quite diverse and include background reading materials, data and maps, satellite imagery and real-time data from Earth observing instruments. Review the information in the NOAA Climate Data Primer to learn more about climate data and how it is acquired and used. Then browse the Dataset Gallery to locate samples of datasets that can be used in ESIs. 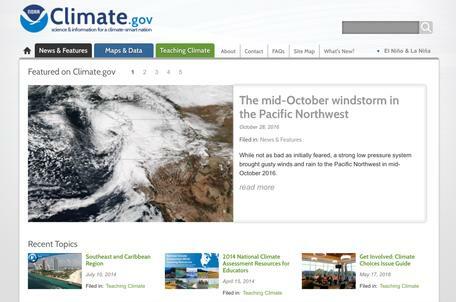 NOAA's Climate.gov is an extraordinary resource. 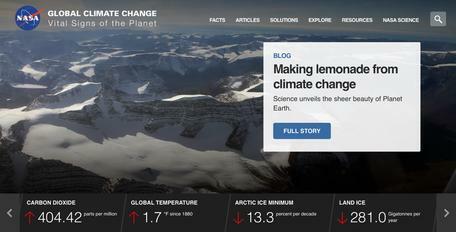 The Climate Dashboard features a range of easy-to-understand climate graphics in a single interface. Featuring the work of NOAA scientists, each Data Snapshot is a student-friendly version of an existing data product. Educators looking for examples of community-level climate resilience work can investigate the Climate Resilience Toolkit. 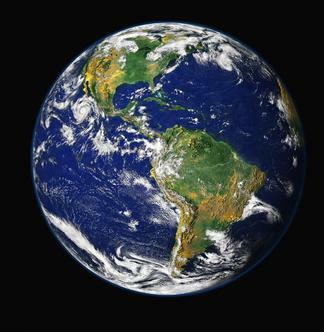 NASA resources - NASA climate resources can be located at NASA Climate From this page educators and students can locate facts, articles, multimedia, and images of change, as well as an enormous selection of resources that can be used in lessons. For other Earth systems topics, NASA has a great variety of resources for educators at NASA Earth Observatory and NASA Science for Educators. The following list of steps will lead you through the Backwards Design process that can be used to design and build a lesson sequence. First, decide what the learning objective for students will be. What key science topic or standard do you want to construct an investigation for? What essential question or questions should students be able to answer and give evidence of deep and enduring understanding at the end of the investigation? Make a list of your learning goals and objectives. Before you begin planning the learning sequence, have an idea of how much class time you want to allocate to the ESI, keeping in mind that some of the assignments may be able to be done out of class as homework. A general rule of thumb: A short video (1 – 6 minutes) or most background readings require about 20 minutes for students to finish and either discuss or answer a series of content questions. Using and analyzing an interactive visualization, and answering summary questions may take 20 – 30 minutes. Hands-on activities can take between 30 and 60 minutes depending on their complexity and number of parts. Go to the CLEAN collection and type in key words to identify your topic. Up will come a list of resources. 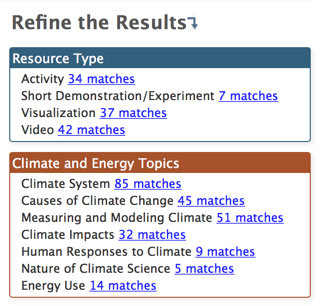 Look at the "Refine Results" box to view the different types of resources in the collection. The figure on the right shows the results for the key words "carbon cycle." Since you are seeking introductory background resources, focus on the visualization and video categories. Then look for NOAA and NASA background reading materials, graphs, and visualizations at the sites listed above. Choose two or three of the resources you feel introduce the essential question and /or topic that you chose for the students to explore.For each resource, write questions for students to discuss or answer, and give other directions as needed. Assemble a report that analyzes local or community data on the topic at hand? Case studies from the NOAA Climate Resilience Toolkit can be a source of inspiration for local projects. Search the CLEAN collection for activities in your topic area that include either a performance assessment as a summative evaluation tool, or that could be used to prepare students to organize and complete a report in a medium that is appropriate for your classroom situation. Check NOAA and NASA resources for visualization, maps, graphics, and datasets that will help students to complete their project. After reviewing background information and defining the questions that need answering in Step 1, students need to widen their knowledge base and prepare to investigate aspects of the primary topic. Search the CLEAN collection for short videos, visualizations, or modeling activities that expand their learning experiences to include different ways to approach content and process ideas. Are there activities that help students make system connections and link aspects of the primary topic to gain a deeper understanding of the science and science process? Now is the time that the missing pieces of the investigation can be placed into the learning sequence. Active learning and data analysis should be emphasized. What resources do you need to move students from a basic understanding of the primary topic to a level of competence required to complete the summative performance assessment? Focus on hands-on activities in this section. Seek resources in the CLEAN collection that highlight and help students analyze aspects of the primary topic while employing science and engineering practices. The activities you choose should build upon one another to give the students a solid foundation of information and data to use in order to complete Step 4. Once you have a list of resources for each step, review the time and materials needed to complete each activity. Decide if students will work on some parts of the investigation on their own time. Will you have students work in small groups or individually? Build a list of resources for students to access and acquire any additional materials that will be needed for the investigation. If you haven't already done so, develop an appropriate rubric for assessment by using your objectives and essential questions from Step 1. Will the students present to the entire class, or have a gallery-walk type information exchange? How will you judge mastery of the information, practices, and concepts that you identified in your original lesson design.